Yeah, yeah, yeah. Winter frost bites, we know. But unless you're some sort of cold-impervious superhuman like red-blooded man-icicle Wim Hof (featured above), or willing to be an ex-pat in a hippy-filled, sub-tropic border town (ew), it's a thing you're going to have to deal with from time to time. Hence the Gizmodo Winter Survival Guide, brought to you by the toughest winter warriors out there, our friends at Columbia. Over the next few weeks we'll be rounding up the top tech items needed to get you through the impending frigid months, so head below to get prepared. The ColdPole Liquid Reservoir Ski Pole is the perfect way to take a nip when you're out in the nippy air. Each pole holds 1/2 pint of liquid in its lightweight aluminum shaft. ColdPole recommends using the reservoirs for liquor only, as non-alcoholic beverages can freeze. You don't have to tell us twice! You never know when a giant snow storm could strike, and you'll have to go all Jack London on that mother. That's why it's essential that you always travel prepared for the worst (or never go outside, ever). 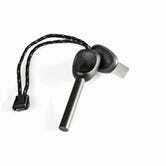 Fortunately, the Light My Fire Firesteel handily attaches to your keychain, works even when damp, and is good for about 3,000 uses. Want to eliminate snow without excessively contributing to global warming? Honda wants to help with its very first hybrid snowblower, The HS1336i. The powerful machine comes with a 4-stroke engine, but also works as a generator, and features a significantly lower gas consumption rate. Finally, you can stress less about your ski chalet one day becoming ocean-front property. Ever been curious as to what the inside of a very pleasant toaster feels like? The Omni-Heat Electric jacket from Columbia heats up on command with the help of electric powered thermal technology—making it the company's most innovative product to date. Simply hit a button and the rechargeable battery releases hours of heat, allowing you to enjoy the winter in a way that those unaided by fancy schmancy technology could never dream of. So go forth little snowmen (and women) and embrace the wintery chill. Before long the sun will be back and all will be right in the world…and if not there is always Omni-Heat Electric. Head to Columbia for tons more ways to survive this season.